With April break finally around the corner, I know I’m not just speaking for myself when I express how relived I am. These past few months since midterms left me fatigued beyond belief. All I want now is to be able to slack off without all my grades dropping down 2 letters. To put it frankly, I needed February break to cut through this seemingly impenetrable layer of stress. But before analyzing the pros and cons of cutting February break, its imperative to acknowledge the distinct difference between a break and a long weekend. Before living through not having February break, I was one of those people who believed a long weekend would be a worthy substitute. After all, we’d already had several snow days/delayed openings. 4 days of uninterrupted relaxation would be more than enough. Little did I know that during those 4 days, I would be inundated with homework and studying galore. Safe to say, I did not relax and that was definitely not by choice. When there’s work to be done, students can’t be expected to slack off. That’s where the full break comes in. During a full break, there are always some outlying long term assignments to complete and maybe a test or 2 to review for, but there is always time to relax. The amount of work given is nowhere near enough to consume the entire time, unless a student decides to do so by choice. Letting work consume downtime is not the same thing as having such a large amount of work that it naturally consumes any downtime. 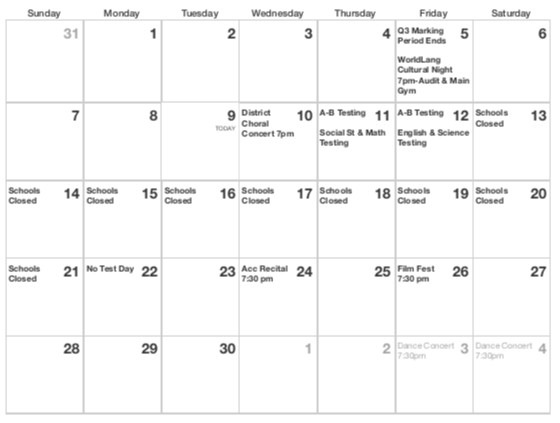 Obviously, the district did not get rid of February break without careful consideration of the reparations. Respectfully, I do want to put in a word for the students, which is why I outlined the role of school in student relaxation. The people making the decisions about which breaks students have aren’t the ones doing our work and our studying. Although, I definitely enjoyed having my religious holiday, Diwali, off this year. And I’m sure people who celebrate Chinese New Year felt the same. For once, it felt great to have my culture acknowledged, to be given the time to celebrate the holiday properly with my family.